The Latendresse Family has been specializing in pearls since 1954. In 1961, John Latendresse founded the American Pearl Company® Inc. in Camden, Tennessee and expanded to Nashville, Tennessee in 1991. Today, Gina, Renee and Chessy Latendresse continue the Latendresse Legacy in their wholesale pearl company, details to follow. The rarest pearls in the world are of natural origin from salt and freshwater. Saltwater Natural Pearls: Abalone, Conch, Melo Melo, Manodeleon, Scallop, Lion's Paw pearls, Oriental, Persian Gulf, "Keshi", Baja, La Paz, Oyster and Seed pearls. Freshwater Natural Pearls: pink, lavender, tangerine, silver and golden color pearls, American natural pearls available in the following shapes: wing, rosebud, turtleback, feather, button, drop, snail, angel, round, semi-round, half-round, near round, off round, teardrop, and dogtooth pearls. Do you know what "slugs" mean in pearl terminology? Some of the pearl farms for cultivating pearls are in Australia, China, French Polynesia, Indonesia, Japan, Philippines, Tahiti, and yes even the United States of America. Saltwater Cultured Pearls: Abalone mab, Abalone blister, Tahitian, black pearls, Akoya, round, drop, button, baroque, semi-baroque, Japanese, and Chinese. Freshwater Cultured Pearls: fancicolor, fancishape, Chinese, round, drop, button, cross, triangle, stick, rice, corn, potato, pillow, Japanese, Biwa pearls and American cultured pearls grown in the Tennessee River near Nashville, Tennessee; exotic shapes of coin pearls, bar, rectangle, drop, cabochon, navette, marquise, baroque and semi-baroque pearls, mab? and blister pearls, and Dome Pearls?. Natural Pearls and Cultured Pearls are available in strands, singles, pairs, full drilled, half drilled, undrilled, natural colors, and enhanced colors. Some enhanced colors are very exotic such as cranberry, cognac, champagne, eggplant, bronze, taupe, sage, apple green, fuchsia, black, and peacock. Of course, the classic white, orange and pink colors are always popular and available. The trade term keshi pearl has been used to describe many types of cultured pearls. They are coveted for their organic shapes and variety of sizes. They vary in color from black, peacock, grey, white to rosea. Rosea is sometimes spelled rose or rosa. Rosea is typically an overtone with white or silver body color. **The term Keshi is controversial. Please call our office for a full explanation. Originally, it was a small pearl produced by the Pinctada fucata mollusk (in Japan) as a byproduct of the culturing process. Today, as defined by CIBJO, it is a cultured pearl formed accidentally resulting from bead nucleation in which a bead and tissue graft is inserted into a saltwater (marine) mollusk and the bead is rejected, leaving only the tissue graft to form a cultured pearl. Keshis very likely occur in freshwater mollusks too, but there’s no way to tell them apart from the millions of purposely tissue-cultured pearls produced annually, therefore, by CIBJO definition, keshis are saltwater cultured pearls. Lagniappe is defined as “something given in addition to what is ordinarily expected“ by Merriam-Webster’s. On our pearl farm, we often implanted two nuclei and were pleasantly surprised by harvesting four “pearls“. Historically, the two extra “pearls” would be considered, keshi. According to the newest definition, this is not valid as our “extras” are harvested from freshwaters. We are now referring to our extra “pearls” as Lagniappe cultured pearls - graciously received, a little something extra from our pearl farming experience. 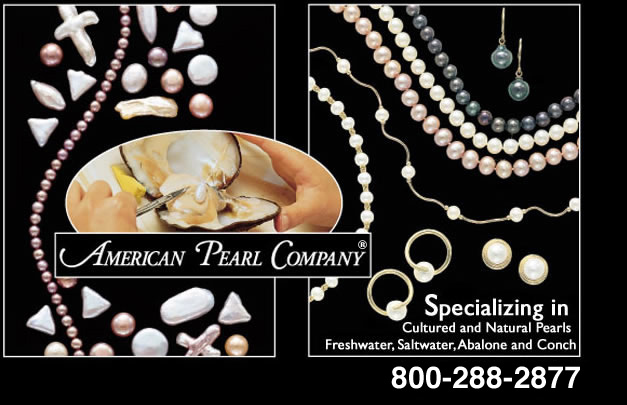 We offer a variety of pearl jewelry featuring freshwater cultured and freshwater natural pearls. Torsades, lariats, earrings, rings, necklaces, bracelets, pendants, enhancers, pearl studs, strands, cufflinks, shirt studs, pearl tie tacs and Tin Cup style pearl jewelry. Pearl strand lengths in our inventory are collar (10"-13'), choker (14"-16"), princess (17"-19"), matinee (20"-24"), opera (28"-35"), and rope (45" plus). Pearl ropes drape the wearer in layers of luster!